CAPE TOWN, South Africa (AP) — The Hangberg community outside ruggedly beautiful Hout Bay is troubled by gang violence, drugs and poverty. One artist trying to break the destructive cycle recently ran a workshop for a group of children from the area to teach them an unusual medium: beach calligraphy. Andrew van der Merwe is a professional calligrapher who 10 years ago found a way to combine his love of the outdoors with his career by writing words and creating designs in the sand. He has presented his unique art form twice at the Sharjah Art Biennial in the United Arab Emirates. 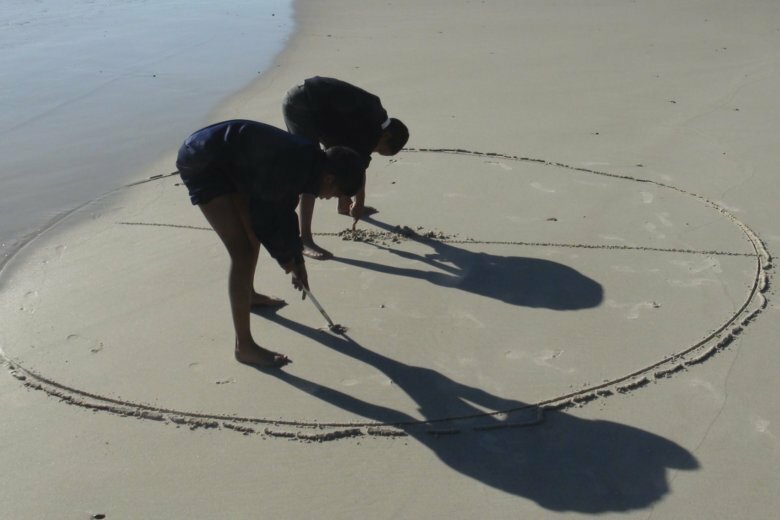 And now he is helping at-risk children such as those from Hangberg to express themselves by carving out beautiful shapes in the sand. The children kids are taught how to use van der Merwe’s hand-crafted tools and found objects like sea shells to make beach calligraphy. And they also see their work washed away by the tides. “These kids came to this workshop just after riots in Hangberg, so for them to go out of that space and into a calm environment where they can express themselves creatively is very beneficial,” said Firdous Hendricks, a coordinator for Lalela, an art education organization that sponsored the workshop. He was pleased that the workshop got “the children out of their densely populated, stressful, littered township environments into a space where they can play with nature in all her beauty without consequence or competition. Good experiences like this create bonds with nature and with each other over nature,” he said. “Once I started to show them the potential they ran with it and clearly had a good time. They began exploring the medium for themselves. I certainly enjoyed it too. It was such a pleasure to see them discover something new,” said van der Merwe. While some artists may struggle with the idea of creating art that will get washed away by the ocean, van der Merwe says it’s more about the process than a permanent art work. “There’s a tradition in the east where Tibetan monks make intricate Tibetan mandalas made out of sand and then they wipe it up. The object of it is to teach the virtue of detachment,” said van der Merwe. “It’s beautiful to watch a foamy wave arrive and fill the letters, see the low light reflect in the letters, see wind leave little ripples in the letters,” van der Merwe said. Back at Llandudno beach the children are excited about what they’ve learned at the workshop.